Do you have an empty house you just want to get rid of? Believe or not, thousands of other homeowners across the country are in a similar situation. You may have an inherited house you don’t want, a house that needs to be sold after a divorce, or even just a home you’ve moved out of and want to get off your hands. No matter what your situation, one thing is for sure: You want to get that empty house sold before Halloween. While this holiday may mean fun costumes and spooky parties for most of the country, it also marks the absolute worst time of year to have an unlived-in house on your hands for a number of powerful reasons. Halloween is a terrible time to be selling a house, and it only gets harder from here. Between the howling winds and rock-throwing hooligans, and empty house is more of a liability than an asset during the cold months. Especially around Big Spooky when teenagers everywhere are up to no good and just looking for a little damage to do that ‘won’t hurt anyone’. If you’ve been trying to sell a house you don’t want that is still on the market in late October, it’s time to do everything you possibly can to get it sold and into the hands of someone with the time and resources to take care of the property. 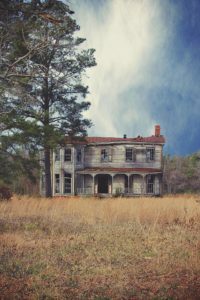 Today, Seller’s Advantage is here to outline the five leading reasons to get your house off the market before the big spooky holiday of costumes, candy, and mischievous property damage rolls around. Whether or not you are afraid of hooligans, the most profound reason to sell your house right now instead of waiting for the “right buyer” to come along is that we are about to enter the dark season for the housing market. Winter isn’t just when the days get shorter and the nights get colder. It’s also the slowest possible time on the housing market. Very few homes sell after mid-autumn and the sale rate slows to a glacial pace once the snows start to fall. Home sales don’t pick up again until spring thaws the ice and begins to inspire thoughts of homemaking, gardening, and the patter of little feet on new hard wood floors. If you don’t want to worry about that house sitting empty for another four to six months, the time to sell is right now before Halloween marks the official beginning of the Holiday season. The next real concern is that, starting with All Hallows Eve, the weather becomes a scary proposition for the exterior of your home. Winter storms are notorious, especially in regions like Philadelphia, Chicago, and of the astoundingly windy Midwest states. Freezing gale-force winds will rip the shingles right off your roof and warp siding with their howling speed. Winds can also break off dry and brittle tree branches, gouging roofs and sometimes even crashing down large branches to create real rooftop holes. And even without the winds, autumn falling leaves followed by piling up snow can cause their own problems. Both piles of leaves and piles of snow can create damp mounts that slowly rot away at your roof. First the shingles, then the timbers underneath will suffuse with trapped water and develop water damage. The roof will get soft in those spots and need serious repairs when the spring rolls around allowing the snow to melt and blowing away the leaves. Another challenge is that houses are much more difficult to maintain in the winter. Particularly in regions where the outside temperature can drop below zero. Leaving a home empty with the utilities turned off is all well and good during warmer months, but there is a serious risk of home decay if you let the house get too cold inside. The materials that home interiors are made of are designed to remain between livable temperatures. Extreme cold can damage and warp the wood, walls, and cabinetry almost as badly as extreme heat and humidity. Then there is the risk of burst pipes. If there is any water at all sitting in the home’s pipes, freezing temperatures risk the pipes swelling with expanding ice and bursting. This creates a truly monumental repair task that will eat into your budget while also adding water damage that will make it even more difficult to sell the home. But even if nothing extreme goes wrong and you simply keep hosting open houses and marketing your house for sale, you will have little luck finding ready buyers. Not only does the housing market slow way down during the colder months, but even buyers who are interested will tend to move more slowly in the buying process. After all, few people want to drive out to a house to walk around the grounds or attend an open house event in cold and snowy weather. This is, in part, because it’s simply less pleasant to travel and check out houses when it’s cold. But if your region experiences snow, buyers may also be hesitant to complete a deal until they’ve seen what the home looks like not covered in a fluffy white blanket. No matter how many cups of cocoa you put out, it will be difficult to get buyers to come out and see your home after Halloween passes. And finally, the reason this is such a profoundly October-focused tip is that Halloween night itself is a very dangerous time for empty houses. Some teenagers and even older hooligans take “Trick or Treat” all too seriously. If there are no decorations, no candy for the kids, and no lights on inside some will decide that this is an affront to the holiday. Their desire to throw eggs, rocks, and rolls of toilet paper will become irresistible. Especially with the floating concept that no –people– will get hurt if they decide to lay waste to your unwanted house. Empty homes are prime targets for Halloween mischief and if no one comes outside shouting, that mischief can quickly get out of hand. If you don’t want to find yourself scrubbing off eggs, gathering scraps of toilet paper, and repairing broken windows, it’s best to get that house sold before the 31st rolls around. Halloween is a dangerous time for empty houses on the market and your prospects for selling only get worse past this point. Fortunately, Seller’s Advantage is here to help. We will buy your home no matter what shape it’s in, how long it’s been on the market, or how haunted the local kids might think the house is around this time of year. We aren’t afraid of ghosts, know how to handle hooligans, and will pay you a fair price for your house after a simple inspection and no-obligation cash offer. For more information about how to sell your unwanted house before the risks of Halloween and the dark winter market beyond, contact us today!